A gasoline smell in car can be very dangerous, you should never have a fuel smell in your vehicle, it’s a sure sign of a problem, and it’s potentially very dangerous. I have seen a lot of fuel leaks in my career, so I have compiled a list of the 5 most common reasons for a fuel smell in a vehicle or when you have your fan on. It really doesn’t matter what is causing the gasoline smell in your car, you just need to have it fixed as soon as you start smelling fuel. If the fuel leak is near the engine or exhaust, it could result in a fire and a potential total loss of your vehicle. The fuel liquid is not the danger, the danger is the fumes, you see, liquid gasoline does not burn; the fumes are what catch fire. It’s rare to see an injector leak, the common cause of the fuel leak is the injector rubber o-ring or seal. Each injector has a rubber seal at the bottom and has an o-ring at the top, these o-rings and seals dry out and eventually crack, once the o-ring or seal cracks, the fix is just a matter of replacing the damaged seal or o-ring, there is no need to replace the injector if it is still working properly. If you have an injector seal or o-ring leaking because of old age, I highly recommend replacing all the o-rings and seals, if the fuel leak was caused by improper installation of an injector, just replace the damaged o-ring or seal and you can be on your way. 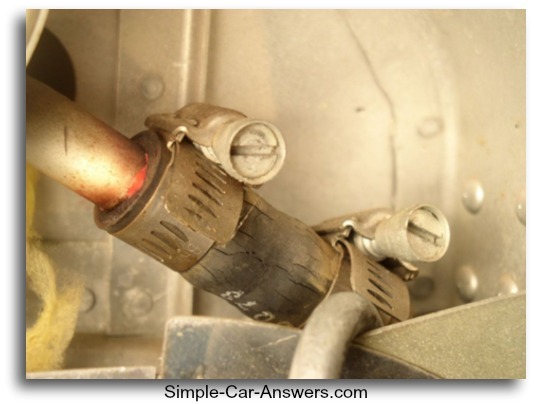 If you suspect you have a fuel injector leaking, open your hood and inspect the fuel rail where the injector are located. Have the engine running and take a look, if you have a fuel leak, you will definitely smell it, and it will be wet with fuel around the injector that has the problem. 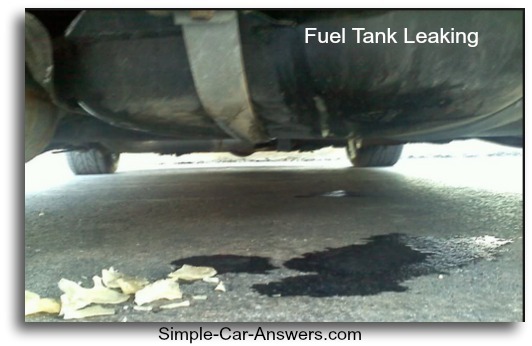 I would have to say that a fuel tank leak is probably the most common fuel leak of all. There are many reasons for a fuel tank to leak, anything from a rotted tank to a punctured tank. If a fuel tank has a leak, it will usually leave a spot on the pavement where you car is parked, this is a potential danger because people who smoke cigarettes like to throw them out the car window, this could potentially ignite the fuel dripping from the tank. It’s usually pretty easy to identify a fuel tank leaking, just crawl under the vehicle, and look for wet spots or stains on the fuel tank. Sometime a fuel tank will leak at the top because moisture and debris get trapped on the top of the tank and it rarely dries out, this causes the tank to rot and eventually leak. If you have a fuel tank that is leaking, it’s best to completely remove it, inspect it and either repair it or replace it. You may not think you could have a gasoline smell in car if it’s coming from the fuel tank, but the fumes travel under the vehicle and enter every crack and crevice. If your fan is on inside your vehicle, the fumes will be sucked in from the fresh air intake, and will cause a potent fuel smell. Fuel lines travel under the vehicle from the fuel tank to the engine, it is very common to have a crushed or rotted fuel line because there is not much protection from road debris and the elements. There are also rubber fuel lines that could potentially leak from old age or could be damaged by someone doing work on the vehicle. 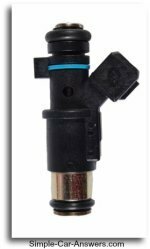 Any vehicle that has fuel injection will have high pressure in the fuel lines. Fuel pressures can run anywhere from 35 psi to 60 psi, if there happens to be a weak line or fitting, fuel will spray out of the line causing a mist or a vapor which is extremely dangerous, especially if near the exhaust or engine. If the fuel line is spraying a mist, the gasoline smell in car will be extremely pungent which could cause nausea or headaches, breathing fuel smells is not good for your health and is very damaging to the brain. 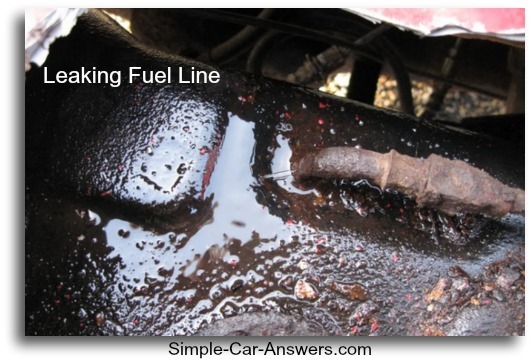 If you think you may have a fuel line leaking, I recommend following the fuel line from the tank to engine, if the vehicle is fuel injected, the line will probably be dripping and will be easy to find. Having a professional repair the fuel line is a good idea, plus if you have any other problems, the mechanic will be responsible for repairing it. Most people don’t even know what a charcoal canister is in a vehicle, never mind what it does. The canister is a plastic container filled with charcoal, and excessive fuel vapors from the fuel tank are purged through the charcoal canister to reduce emissions before sent out into the atmosphere. If the charcoal canister has a crack in it or is leaking through a faulty vent or seal, the result will be a fuel smell and possibly a check engine light DTC. 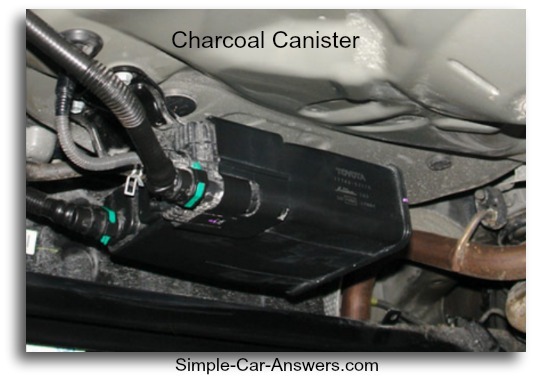 Older vehicles had the charcoal canister located near the front of the vehicle, often in the engine compartment, but since the mid 2000’s, car manufactures now locate them closer to the fuel tank along with a plethora of other emission control devices. If the charcoal canister did have a problem, most likely the check engine light would illuminate and set a diagnostic trouble code (DTC). If you have a fuel smell and the check engine light is on, I recommend having the code pulled first; it will usually point you in the right direction on what’s causing the problem. 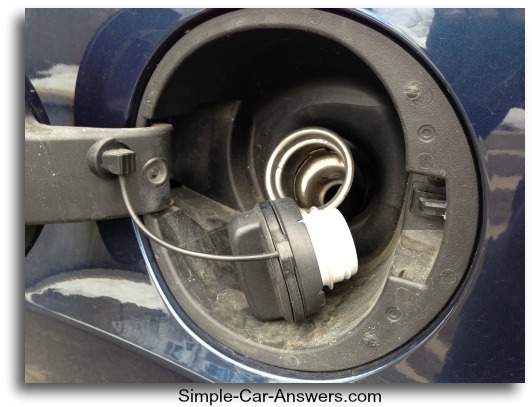 I know it may seem obvious, but a loose or missing gas cap can cause a fuel smell in your vehicle. You could even have a faulty gas cap that is leaking fumes. A faulty gas cap can also cause the check engine light to illuminate with a DTC on newer cars. The fuel tanks on newer vehicles are placed in a vacuum and tested for leaks, your vehicle performs this self test to check for leaks in the fuel system. If the vacuum test is performed and does not pass, the check engine light will illuminate and set a DTC. Common sense will go a long way if you have a gasoline smell in your car. If you have a fuel smell, get it checked out quickly, it could be extremely dangerous. A small gas leak that would cost a couple hundred dollars to fix could cost you a total loss of your vehicle if not diagnosed and taken care of promptly. 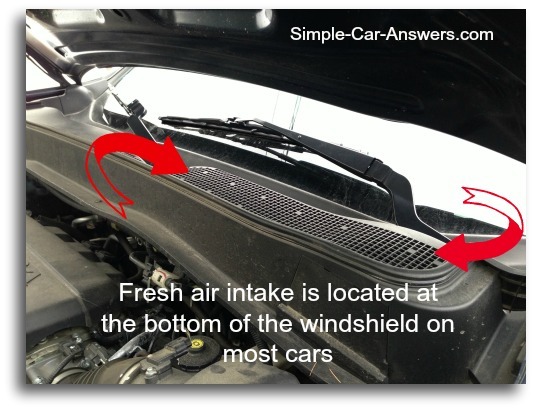 Whenever you are running the fan inside your car, you are taking in outside air, if you have a fuel leak, the vapors will be sucked into the passengers compartment through the fresh air intake. The intake for the blower motor is located at the bottom of the windshield near where the wipers sit when parked. There is one way to temporarily stop fumes from entering the vehicle when using the fan; you can use the recirculation button on the climate control, which will recalculate the cabin air and stop the air from being drawn in from outside. I don’t recommend using this function for long periods, because it will eventually cause the windows to fog on the inside of the vehicle, the fogging can be prevented by simply using the air conditioner while in recirculation mode when possible. If you have any questions, leave them in the comment box and I will get back to you. I would really appreciate it if you could share this article or site with friends on Facebook and Twitter, I know a lot of people are looking for this information and it could save lives.